April is the peak of spring bird migration here at the Houston Arboretum. Tanagers, vireos, warblers, hummingbirds, and many others are flocking to our sanctuary on their journey north from Central and South America. After flying thousands of miles – including a 500 mile flight over the Gulf of Mexico – birds need food, water, and shelter, which are hard to come by in urban Houston. Sanctuaries like the Arboretum are critical safe havens for migrating birds. By providing protected spaces with native plants, clean water, and natural habitat, we can help birds when they arrive in North America in the springtime. But what about the rest of the year? Migrant birds spend the winter in Central and South America. They still need protected places to get food, water, and shelter. Unfortunately, just like in North America, good habitat is hard to come by. 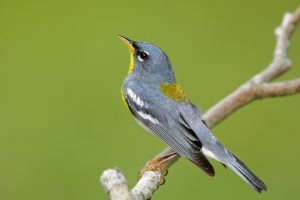 Deforestation, urbanization, and intensive agriculture have damaged or destroyed much of the habitat that migrant birds need on their wintering grounds. For example, we get most of our coffee from plantations in Central and South America. Traditional coffee plantations require farmers to destroy forest habitat and plant huge fields of nothing but coffee shrubs. Birds cannot find all of the food and shelter they need in a traditional coffee plantation. Shade-grown coffee is different. Some coffee farmers recognize that traditional coffee plantations are bad for birds and other forest animals, and they have developed a new system that allows both coffee production and habitat protection. The farmers plant coffee shrubs under at least one layer of forest trees. This creates a more varied, natural habitat that provides food and shelter for migrating birds and other animals. Birds that use shade-grown coffee plantations during the winter include Summer Tanagers, Ruby-throated Hummingbirds, Indigo Buntings, and Broad-winged Hawks. We see all of these birds at the Arboretum during spring migration. Although it is a relatively short-distance migrant, we feel a special connection to the Summer Tanager because it is featured on the label of our Houston Arboretum “Early Bird” blend of Katz Coffee. Summer Tanagers spend the winter in Central and South America – often in bird-friendly coffee plantations – and then migrate to breed in the southern part of North America. They are gorgeous birds: males are scarlet red, while females are a warm gold. They specialize in eating wasps and bees, but will also eat fruit. 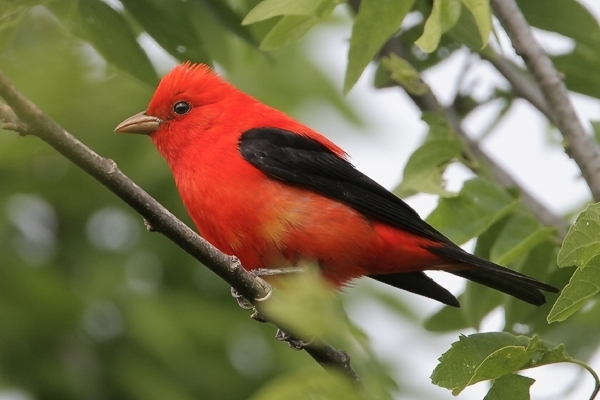 Summer Tanagers prefer to live in open woodland with plenty of insects and berries. At the Arboretum, look for them in trees around the edges of our ponds. 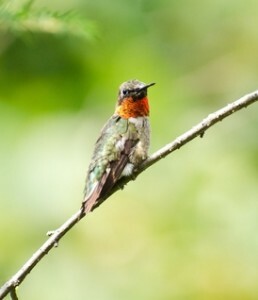 Ruby-throated Hummingbird – another migratory bird seen in the Houston area. The Houston Arboretum has partnered with Katz Coffee to create the Early Bird coffee blend. Early Bird is shade-grown and bird-friendly, promoting habitat protection for migrant birds. Part of the proceeds also help support the Arboretum. It is a delicious way to help birds all year long: the coffee farms protect birds in the winter, and the Arboretum protects birds in the spring. This Saturday, April 30th at 7:00 am, Katz Coffee will come to the Arboretum for a special Early Bird Coffee Morning. We will celebrate spring migration with bird watching, delicious coffee, and breakfast treats. This is a great chance to not only learn about our spring migrants, but also about responsible coffee production. Kelsey Low will lead participants on a bird walk and will answer your questions about bird identification and migration. Katz Coffee will share their philosophy about coffee-making and will also give out samples of the Early Bird blend for you to try at home.